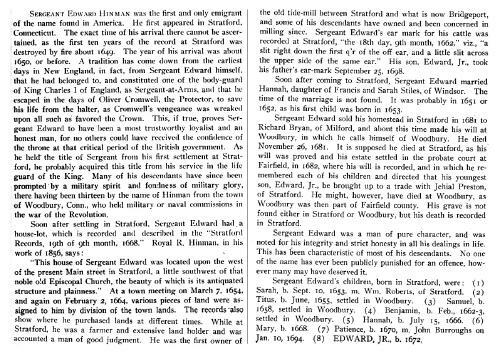 Sergeant Edward Hinman was born perhaps about 1630. About 1651-3, Sergeant Edward had a house-lot in Stratford, "which houselot lyeth for 2 acres, be it more or less, butting east upon the street, (now Main street in Stratford) butting west uppon ye home-lot, at present, of Francis Hall, bounded south-west, John Tomson, senior, and north-west, Mr. Joseph Hawley." (Stratford Rec, 19th of 9th month, 1668.) This house of Sergeant Edward's was located upon the west side of the present Main street in Stratford, a little south-west of the old Episcopal church. At a town-meeting in Stratford, held March 7, 1654, it was voted "that Edward Hinman should have for his use that parcel of meadow which lyeth west of Mr. Stile's house, on this side of the further Milne river," for his own use, so long as he stays or will make improvements, only to list it and to," (obliterated on record.) Sergeant Edward sold his interest in the above meadow, (June 10, 1659) on the west side of Mr. Stile's house on " this side of Milne river." February 2d, 1664, he had 22 acres of the last division of land laid out to him on the east, and another piece on the west side, of 8 acres. He died on November 26, 1681. It is supposed he died in Stratford, Connecticut, as his will was proved and his estate settled in the probate court at Fairfield, in 1682, where his will is recorded. He gave his lands at Woodbury to his son Titus. 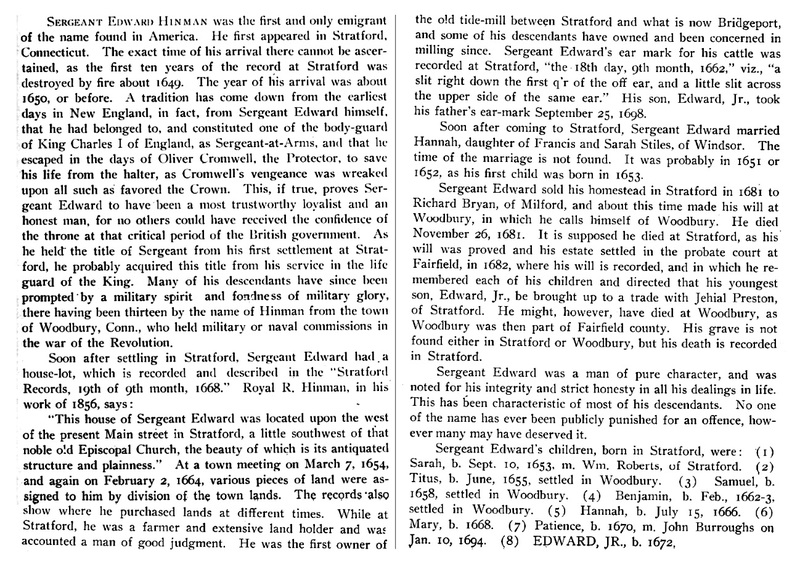 He notices his sons Benjamin, his daughter Sarah Roberts, his son Samuel, and daughters Hannah, Mary, and Patience, and his youngest son Edward, Jr., his brother Ephram Stiles, and directed in his will that his son Edward, Jr., should be brought up to a trade with Jehial Preston, of Stratford. Royal Ralph Hinman, A catalogue of the names of the early Puritan settlers of the colony of Connecticut: with the time of their arrival in the country and colony, their standing in society, place of residence, condition in life, where from, business, &c., as far as is found on record, , at https://books.google.com/books?id=KTkBAAAAYAAJ . Hartford: Press of Case, Tiffany and Company, (1852) , p. 807. Royal Ralph Hinman, A catalogue of the names of the early Puritan settlers of the colony of Connecticut: with the time of their arrival in the country and colony, their standing in society, place of residence, condition in life, where from, business, &c., as far as is found on record, , at https://books.google.com/books?id=KTkBAAAAYAAJ . Hartford: Press of Case, Tiffany and Company, (1852) , p. 809. Royal Ralph Hinman, A catalogue of the names of the early Puritan settlers of the colony of Connecticut: with the time of their arrival in the country and colony, their standing in society, place of residence, condition in life, where from, business, &c., as far as is found on record, , at https://books.google.com/books?id=KTkBAAAAYAAJ . Hartford: Press of Case, Tiffany and Company, (1852) , p. 809-810. Royal Ralph Hinman, A catalogue of the names of the early Puritan settlers of the colony of Connecticut: with the time of their arrival in the country and colony, their standing in society, place of residence, condition in life, where from, business, &c., as far as is found on record, , at https://books.google.com/books?id=KTkBAAAAYAAJ . Hartford: Press of Case, Tiffany and Company, (1852) , p. 886. Record added: Sep 25, 2009.